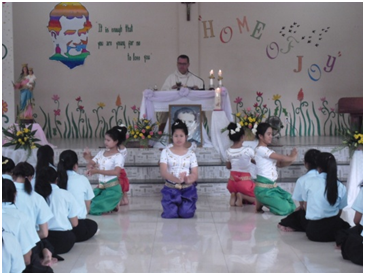 Saint John Bosco’s feast day came to Phnom Penh one day earlier this year. It’s a day when students in all “Don Bosco Schools” take time to remember the life and teachings of such a wonderful and inspirational saint- one who taught us the importance of loving and caring for youth. 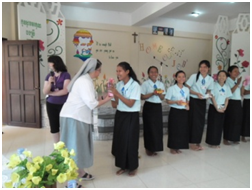 Celebrations began early in the morning at the Don Bosco Vocational School for Girls, Toul Kork. Students celebrated Mass with a special celebrant, Msgr. Bishop Olivier Schmitthaeusler, who reminded the girls of the importance of education which will not only bring prosperity to their own lives, but it can also help their country. 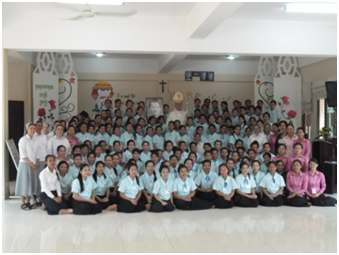 After Mass, we had our annual English speech competition. More than 30 second-year students were chosen to take part in the event. There was a wide range of topics this year. Some students spoke on the importance of education, some spoke about their best friends or who they most admire and others chose to speak about tourism and development. Five winners were selected from each class. Everyone cheered as the awards were given. Many students seemed surprised they were chosen, but they were definitely very excited and felt very honoured for the recognition. The day ended off with the annual and always highly anticipated volleyball tournament. The court was packed with cheering fans from the three schools: The Vocational Training Centres for Girls in Tuol Kork and Teuk Thla and the Don Bosco Technical School in Phnom Penh Thmey. The games were very tense and the results were very close. In the end, TeukThla was named the winner, but all students had a wonderful time playing. Everyone was joyful and humble, just as Don Bosco taught us to be.